Special occasions are always a good reason to celebrate with friends, family or colleagues. 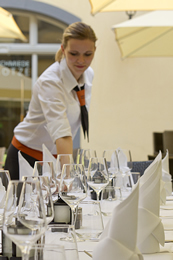 In order to avoid a lot of organizational tasks many people decide to invite their guests into a local restaurant. 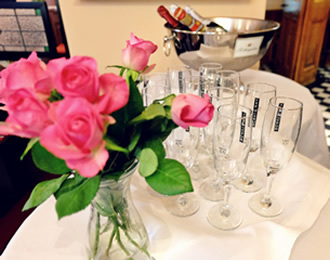 Over the last years, our team has organized and realized several in-house events such as anniversaries, birthday parties, weddings and other festive occasions. We do not only welcome private groups, but companies, business groups and associations as well. Therefore, we are always open for new ideas and all kinds of event requests. Our restaurant is divided in three different rooms which contain a capacity for up to 170 seats. In concern of a cocktail reception we can even host more people than that. In addition, our guests are free to use the big courtyard located in the historical Barthels Hof for their events. 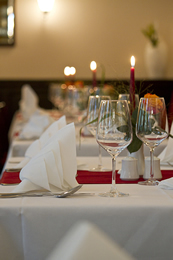 Are you looking for an appropriate restaurant for your event? Do you prefer a buffet or a menu? What about the seating and the table decoration? Indoor or outdoor? Do you plan a dessert variation or welcome drinks? All those questions are important and should be taken into consideration while planning your event. We help you with the development of an individual concept that comply your ideas and requests. Take a look at the rooms of Gasthaus Barthels Hof within the online gallery.